Approaching Eternity is a semi-autobiographical piece for large chamber orchestra. The piece, though it is conceived as one swath of continuous music, is broken up into seven major sections. The piece functions in one continuous arc, like the life cycle of a person, with each section representing a plateau in one’s life from birth to death. The names of the sections are demarcated by cryptic ‘totems’ that refer to pieces of poetry, visual art, music, and literature that serve as the main source of inspiration for each respective section. Approaching Eternity is linked together by a web of motifs, most (but by no means all) of which are generated by the simple cell of three falling pitches. At the height of the fifth section (...you, whom I expected to see at the end of the rails beyond the horizon...) the piece directly references and quotes Erich Wolfgang Korngold’s score to the 1939 film The Adventures of Robin Hood. 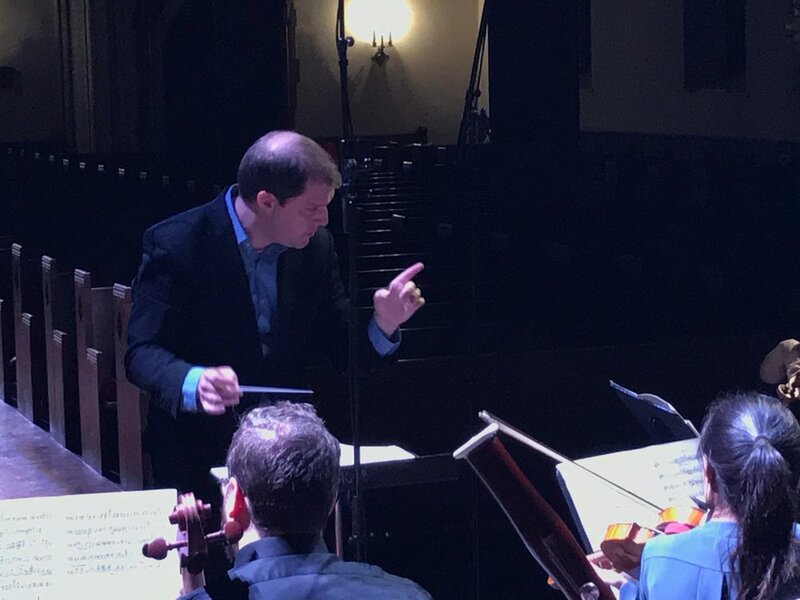 Approaching Eternity was commissioned by Symphony Number One and its music director, Jordan Randall Smith - without his efforts this piece would never have been possible. With his music being hailed by Christopher Rouse as "striking," Nicholas Bentz is forging a path of the composer-performer that hasn't been explored in generations. Equally at home on the violin, Nicholas has performed with orchestras from across the world, soloing with the Charleston Symphony Orchestra, Pacific Philharmonic, Piccolo Spoleto Festival Orchestra, and Symphony Number One. Nicholas has also performed with the Summit Festival Orchestra, Aspen Festival Orchestra, Aspen Opera Theatre Company, and the Moscow Symphony Orchestra. Nicholas has participated in masterclasses with Alexander Kerr, Victor Danchenko, and Vadim Gluzman. He is the former concertmaster of Symphony Number One, and was previously the co-concertmaster of the Peabody Concert Orchestra and the College of Charleston Chamber Orchestra. 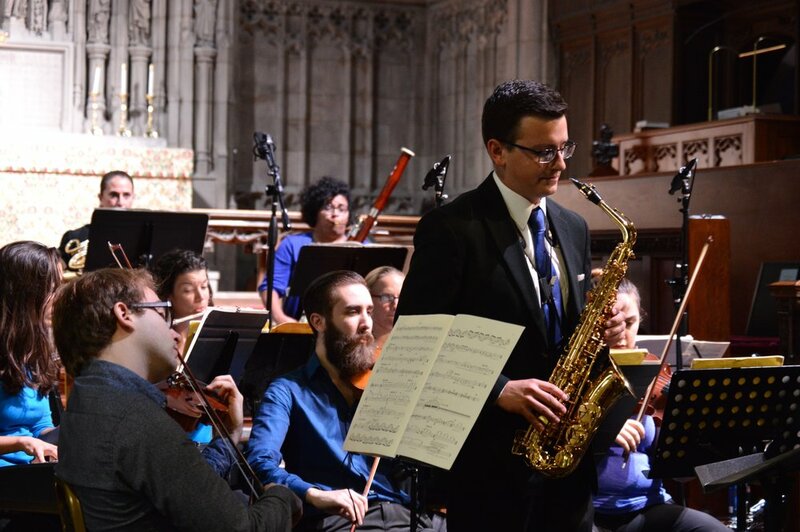 As a dedicated chamber musician, Nicholas has worked with Now Hear This, SONAR New Music Ensemble, Peabody Camerata, Charm City Collegium, and the College of Charleston Contemporary Music Ensemble among others. Nicholas was a winner of SONAR New Music Ensemble's RADARLab Competition as well as the Baltimore Choral Society's Student Composer Project. Nicholas attended the Aspen Music Festival and School for six summers, and was chosen as a finalist for the Dorothy DeLay Fellowship Competition in 2012. Nick's music often takes its inspiration from pieces of literature and poetry, film, and visual art. As a composer he has received commissions from the Johns Hopkins University Applied Physics Laboratory, the Robinson Jeffers Association, the College of Charleston Contemporary Music Ensemble, SONAR New Music Ensemble, Troika, Symphony Number One, and the Charleston Symphony Orchestra, and has had his music played by the Peabody Modern Orchestra. Smith, Tim (August 21, 2017). "Symphony Number One showcases new work from diverse composers". The Baltimore Sun. Lundquist, Tiffany (August 18, 2017). "Nicholas Bentz on New Symphony Number One Album". The Peabody Post. With his music being hailed by Christopher Rouse as "striking," Nicholas Bentz is forging a path of the composer-performer that hasn't been explored in generations. His music often takes its inspiration from pieces of literature and poetry, film, and visual art. As a composer he has received commissions from the Johns Hopkins University Applied Physics Laboratory, the Robinson Jeffers Association, the College of Charleston Contemporary Music Ensemble, SONAR New Music Ensemble, Troika, Symphony Number One, and the Charleston Symphony Orchestra, and has had his music played by the Peabody Modern Orchestra. Nicholas was a winner of SONAR New Music Ensemble's RADARLab Competition as well as the Baltimore Choral Society's Student Composer Project. He was also a finalist for the ASCAP Morton Gould Young Composer Awards in 2014, and is the Composer in Residence for Symphony Number One's 2016-17 season. Equally at home on the violin, Nicholas has performed with orchestras from across the world, soloing with the Charleston Symphony Orchestra, Pacific Philharmonic, Piccolo Spoleto Festival Orchestra, and Symphony Number One. He has also performed with the Summit Festival Orchestra, Aspen Festival Orchestra, Aspen Opera Theatre Company, and the Moscow Symphony Orchestra. Nicholas attended the Aspen Music Festival and School for six summers, and was chosen as a finalist for the Dorothy DeLay Fellowship Competition in 2012. In 2014 he was selected as a finalist for the Marbury Competition, and was the winner of the Pacific Region International Summer Music Academy Concerto Competition. Nicholas has participated in masterclasses with Alexander Kerr, Victor Danchenko, and Vadim Gluzman. He is the former concertmaster of Symphony Number One, and was previously the co-concertmaster of the Peabody Concert Orchestra and the College of Charleston Chamber Orchestra. As a dedicated chamber musician, Nicholas has worked with Now Hear This, SONAR New Music Ensemble, Peabody Camerata, Charm City Collegium, and the College of Charleston Contemporary Music Ensemble among others. An avid and sought-after interpreter of new music, Nicholas has commissioned and premiered a large number of pieces ranging from chamber and solo pieces to concerti and multimedia works. Nicholas currently attends the Peabody Institute of the Johns Hopkins University where he is pursuing degrees in both composition and violin under the tutelage of Kevin Puts and Herbert Greenberg as a recipient of the Randolph S. Rothschild, Eugene Scheffres, and Richard E. Hartt Scholarships as well as the David and Karen Stahl Memorial Scholarship through the generosity of the Charleston Symphony Orchestra League. His previous composition teachers include Yiorgos Vassilandonakis and George Tsontakis, and his previous violin teachers include Yuriy Bekker and Diana Cohen. For the first time, the complete video of our performance of Dérive 2 by Pierre Boulez is available online. Happy Birthday to the late Pierre Boulez, born on this day in 1925.